We need to talk. Do you know what this is? This is a cake–actually, three cakes–into which is baked a pie–actually, three pies–that is then frosted in cream cheese frosting. If you are interested in food, and by that I mean that you are not just interested in eating food, but also interested in reading about food and investigating food phenomena such as the encroaching desire some people have to stuff things into other things several times over (see: the turducken), you will have heard of the cherpumple by now. Created by performer and humorist Charles Phoenix, the cherpumple has reached the status of legends in just a few short years. As far as I can tell, the cherpumple made its first appearance in 2009, when Phoenix unleashed the dessert(s) onto the unsuspecting YouTube masses via a jaunty instructional video that was taped in a vintage kitchen appliance warehouse. The cherpumple was an instant hit. Bon Appétit Magazine was quick to pick up on it, calling it “The World’s Most Insane Dessert,” and these days a simple Google image search for “cherpumple” will net you well over 12,000 results. Recently, Food52 and Serious Eats took the idea of the cherpumple to another level and back again, holding a “Cherpumple-Off,” in which one entry featured an entire Thanksgiving meal baked into itself and stacked up, cherpumple-style, with an actual turducken layer (chicken pot pie baked into a cave of turkey and duck meatloaf) serving as the lid. Then it was frosted in mashed potatoes. This is the type of ingenuity makes me want to weep with joy. Sure, I could be utterly disgusted by all this. I mean, a cherpumple is, to be honest, a completely horrifying affair. But to take it to an entirely different level, wherein one actually creates an homage to the cherpumple that features an homage to the terducken, the cherpumple’s holy inspiration? That’s just art, my friends. I may not want to actually eat any of it, but I remain, nevertheless, impressed. I kinda want you to make this. If you made it, it might actually be edible. In fact, I challenge you to make this and make it something I’d actually want to put in my mouth. I might even be up for helping you…. I am not going to lie, Sara. 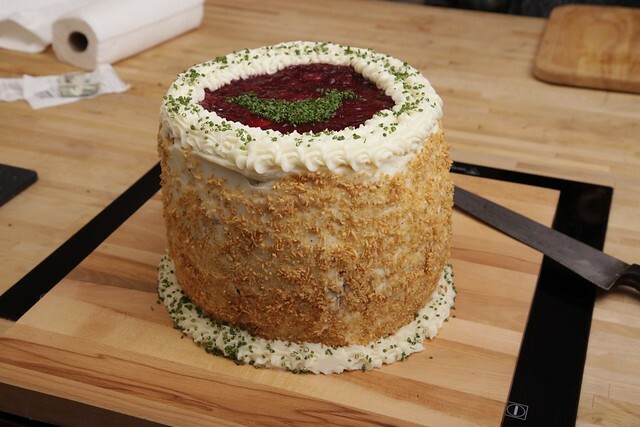 I very–very, very, very–briefly thought about making a cherpumple, once I saw that there was a savory version in the works. The sweet version makes me feel a little queasy when I think about it, but that non-sweet version that Serious Eats concocted (it’s frosted in MASHED POTATOES, for goodness sake) actually piqued my interest. God help me, this just might happen someday. It’s so intriguing, isn’t it?! The cherpumple might end up being my personal Everest. Let us know when you cherpumple. (Look, I turned it into a verb!) Heck, let us know beforehand, and we can test it with you. You wouldn’t want to have an entire cherpumple for yourself, would you? My kids were gobsmacked by the idea of a turducken, many years ago, so I bought the frozen name brand version and baked it for them. (I was NOT going to actually create one.) It was a teen boy dream, but the fantasy far exceeded the reality. They were pretty amused, anyway. The more I think about the cherpumple (or, as you put it, cherpumpling), the more tempted I get. Good lord, I might just end up doing this. I think “frosted in mashed potatoes” is the best phrase I’ve heard all month, lol!